The proposed Hillview Crossing development will have to wait for another day, yet to be determined, before it’s considered for approval. The City Council’s Land Use and Planning Committee has debated the project since December. Disagreement over block lengths, pedestrian convenience and the timing of a stormwater report continued to hang over a proposed South Hills development on Wednesday and postponed for another week an elusive vote on the project, even after two hours of further debate. 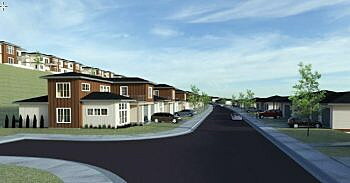 Developers, who are seeking a conditional use to build a 68-unit townhome project dubbed Hillview Crossing, described the process as inexplicable. They suggested the city had singled out their project and had essentially killed it by the end of Wednesday’s hearing. Members of the Land Use and Planning Committee tabled their discussion on trails and block lengths after debating whether to require one or two paved pathways with stairs through the center of the project. While the developers have offered to build a trail east of the project to accommodate the development’s pedestrians, several council members weren’t supportive of that solution, saying it didn’t break up what they see as being long block lengths. Requiring two internal paths with staircases failed to win a majority vote, prompting the committee to focus on a single path. But that too wasn’t universally supported, with some members of the committee saying pedestrians would still have to walk too far to reach their destination. Developers have said the city’s call for a staired pathway would cost around $140,000, adding around $2,000 to the price of each home. The committee ultimately tabled a vote on the issue until a further date, which wasn’t set. Disagreement also surfaced as the committee attempted to discuss the timing of the project’s stormwater and geotechnical report. Members disagreed on whether the report should come before a conditional use is granted or as an added condition of approval for the requested project. In an effort to expedite the process, council member Michelle Cares attempted to allow the report to come later as part of the larger condition of approval. But that didn’t win the committee’s support. The requirement also drew opposition from Ramos, who suggested that members of the committee didn’t trust the work of professional engineers. That drew a retort from council member John DiBari. Speaking for his clients, McCormick said the city’s added requirement that it see the report so early in the process essentially served as a denial of the project and ran contrary to the city’s own application process. Wednesday’s hearing on the project marked the sixth since December. While the developers had hoped to begin work this year, one representative suggested that’s not likely to happen given the pace of the city’s decision, and with construction prices rising, the entire project could fall apart. Another hearing will be needed before approval can be rendered or denied, but the committee set no date for the hearing.